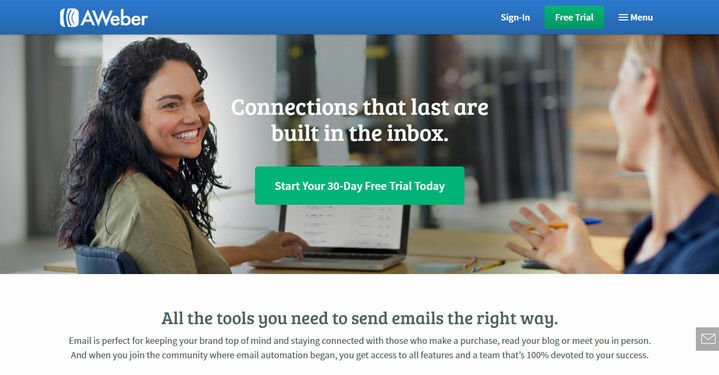 AWeber is a complete email list builder service which is perfect for small businesses, bloggers, entrepreneurs or any online services. With 17 years of experience in the field, the service comes with all the necessary features for managing your email list. The service enables you to group people into separate lists and send customized emails to each list. You will also get detailed analytics about the emails you send to your list. It is also possible to integrate AWeber with various third-party services. Let’s take a quick look at the pros and cons of AWeber. Plan 1: Costs $29 per month. Supports 501 – 2,500 subscribers. Plan 2: Costs $49 per month. Supports 2,501 – 5,000 subscribers. Plan 3: Costs $59 per month. Supports 5,001 – 10,000 subscribers. Plan 4: Costs $149 per month. Supports 10,001 – 25,000 subscribers. Plan 5: Request for pricing. Supports 25,000+ subscribers. Is AWeber Right for You? If you require the advanced options and use autoresponder all the time, AWeber will be a great fit for you. The WYSIWYG editor allows you to create or customize any existing email template. The analytics and reports are useful features too. And if you are looking for alternatives to AWeber, you should check out MailChimp, GetResponse and Mad Mini. AWeber offers reliable email list management service for both individuals and companies. If you haven’t used it before, you should start with $1 trial for 30 days. If everything works out for you, you can easily extend your plan and continue using AWeber.